T-minus 2 days to Marathon! Honestly, this part is hard. All the training is done, the miles and long runs are behind me. I’m as ready as I’ll ever be, and now I’m forced into “taper mode.” For someone who’s used to running and pushing the limit every day, holding back is torture! My last long run was a 20 miler two weeks ago. It was made infinitely more bearable by running it with my daughter, Karen. 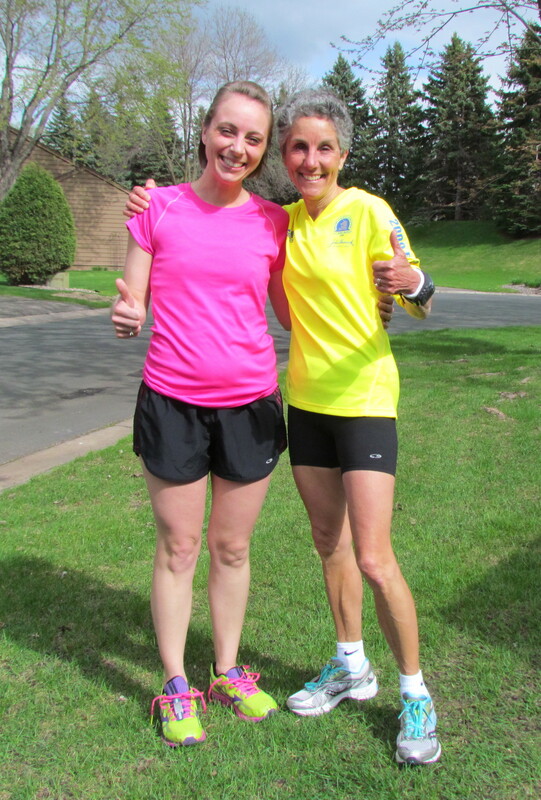 Although we’re training for different marathons, we both had the same long runs to do. It was my last 20 miler, her first in the training regimen. We set off together and used the time to good advantage, keeping up a constant conversation. We covered a lot of ground and finally caught up on each others’ lives. It was worth the 20 miles to have the time together. Really. This week I’m supposed to be resting. Doing short runs, taking days off and gathering strength for the big day on Sunday. It’s not working very well… I’ve decided I am not going to sacrifice living for the sake of shaving a few minutes or seconds off my marathon time. So although I’d already run this morning, I hopped on my bike this afternoon – it was just too nice not to! Now it’s a mind game. Checking the weather forecast. Wishing I hadn’t. Thunderstorms are not my preferred running conditions. Neither is heat. Even this morning, the temperature in Duluth was a sunny 45 degrees as I set out for my run. Minneapolis is predicted to get into the 80s on race day. My body is not ready for heat. I’m looking forward to the Expo tomorrow. Packet pick-up is always an infusion of energy and excitement – the first surge of adrenaline for the race. I love walking up to the table with registration packets, under the Marathon heading. The big one. That’s for me. This is my first marathon in almost three years. And I’m ready. Minneapolis Marathon, here I come. Good luck Molly. Hope the weather isn’t too hot or rainy – enjoy the day!